Nobody cruises further than our Cruise Catamaran. 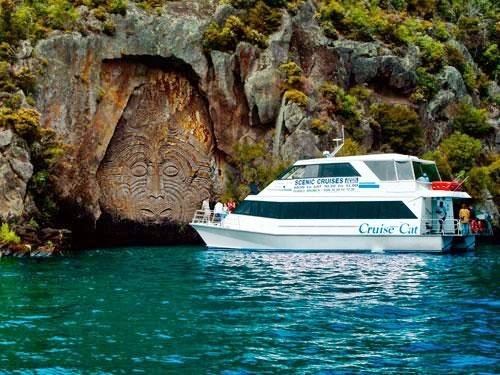 Once aboard the Cruise Cat you can take a seat and enjoy all the comforts as you cruise to the Maori Rock Carvings and around the picturesque bays of Lake Taupo. A full commentary is given on the volcanic history and Maori mythology surrounding Lake Taupo. Take in the fabulous views of secluded bays and the spectacular mountain peaks of the World Heritage Tongariro National Park. Daily scenic cruises operate all year round, except for the twilight cruise, and the scenery is stunning. On a clear day, the majestic volcanoes of Ruapehu, Ngauruhoe and Tongariro can be seen from the Southern end of the lake. This scenic cruise is the smoothest, fastest and most comfortable way to see the Maori Rock Carvings and all the fabulous sites. The Maori Rock Carvings are not ancient carvings but were created using traditional techniques in the late 1970’s. They tell the history and mythology of the local Ngati Tuwharetoa. All our scenic cruises depart from the Taupo Boat Harbour and cruise around the northern bays of Lake Taupo, around Tapuaeharuru Bay and right out to Kaiaipo Bay. All our scenic cruises are subject to weather conditions. Should the lake be too rough to make it around Rangitira Point to see the Maori Rock carvings, you skipper will advise you of this beforehand.